There are times when it is great to be able to step back and laugh at yourself. The current Trellis "situation" is one of those times. When I've made three body pieces and have three different armhole heights. 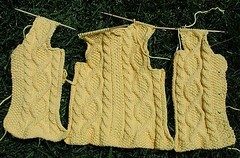 Here we have the three pieces with the three armhole heights. I give you a side by side comparison to illustrate that the fronts don't match, either. So just what does a knitting geek do? 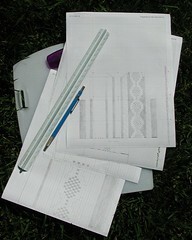 She grabs her drafting pencil and scale, along with some correctly gauged knitting paper. Aha! The back is just about the right height1. Oy is Right. This doesn't really upset me all that much because of two reasons. 1. This is my first sweater/cardi (okay, the second, but it will be first completed) and 2. I planned on redoing the front for a neater button band. 1 And note, the back is one row off, too. Hah. Somewhere near the cable straightaway sides where I must have assumed I'd already advanced my little round row counter. I sharpened the pics a bit so you can see more knit detail. Any suggestions for button bands? This one calls for seed stitch. Uhmm. Hrm. This would be the main reason I haven't done a sweater or cardi yet. I know me, and they wouldn't match up, or get anywhere close to matching. Oy - it happens. I finished my Lara, and well, I can't figure out who I was knitting for, but it sure wasn't me. Bleh. 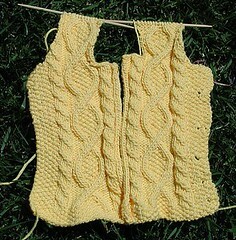 After reading your comment to Yarn Harlot, I had to pop over and check out your sweater, to try to figure out why you were knitting a sweater with 3 armholes. Duh. I just want to say it will be gorgeous when done. (I have only ever knit fairisle sweaters in-the-round, because I know I would do worse than crooked armholes if I tried a cardigan!) Check out "Fluffa! ", Skinny Rabbit, who looks really good at button bands. This page contains a single entry by freecia published on July 18, 2005 3:06 PM. Rock It like a Rocket! was the previous entry in this blog. Oakland Fiber Arts Market - Fri to Sun July 22 to 24 is the next entry in this blog.